By Kristin Masters. Feb 12, 2019. 9:00 AM. Today is the anniversary of President Abraham Lincoln's birthday. In addition to having been an exceptional statesman, Lincoln, like many of America's forefathers was also a prolific reader, amassing an impressive personal library. In honor of the late, great president, we've put together a post to give you a look inside presidential libraries. Though we tend to pigeonhole Washington as a war hero, he actually had an extensive library. All the books were cataloged, and his library was split among family members after his death. Washington was always self-conscious about his lack of formal education, and he was rather discreet about having a personal library. But his collection spoke to the complexity of his life: it included a math book he bought at the age of 16 for self-instruction, along with works by classical authors like Plutarch. In sum, Washington had over 1,200 volumes. Washington also had a bit of a dirty secret: he borrowed two books, due November 2, 1789, from a Manhattan library and never returned them. The fee today would exceed $300,000! Thanks to a generous grant, Washington's library was recreated, book by book, at Mount Vernon. 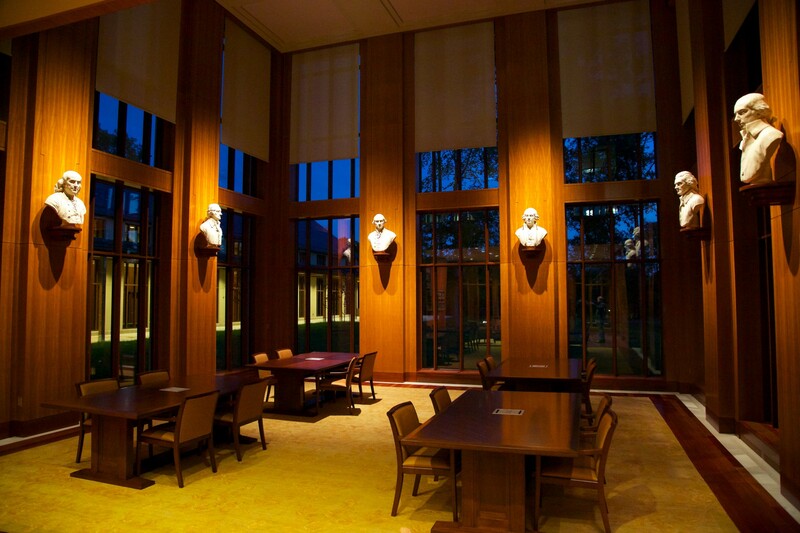 The Fred W. Smith National Library for the Study of George Washington opened its doors on September 27, 2013. The George Washington Library (Mount Vernon, VA) reading room. Source. Today, the George Washington Library in Mount Vernon offers impressive programming pertaining to the library itself, fellowships, digital history, and a leadership institute. Scholars can find primary and secondary sources from the Washington family including manuscripts, maps, and a host of other resources. Those with research requests can contact the library directly to set up an appointment. As one would expect from a scientist, ambassador, and polyglot, Benjamin Franklin amassed a large and diverse collection of books. A few titles stick out as odd, such as Cursory Reflections on the Single Combat, which focuses on dueling, and An Account of How the Earl of Essex Killed Himself in the Tower of London. Franklin's library also included many treatises on religious freedom that would have been considered quite controversial at the time. He read closely about wars around the world and followed many seminal court trials. Franklin played an important role in the history of libraries. He was responsible for opening the first subscription library in Philadelphia. In 1731, Franklin and his cohorts from Junto, a philosophical association, pitched in to fund the purchase of the books to fill the library's shelves. They wanted to be able to have reference work to settle disputes within their group and to provide resources for those who could not afford to purchase books themselves. The library took as its motto a Latin phrase which roughly translated reads: "To support the common good is divine." The library Franklin helped to establish inspired others around the fledgling colonies to do the same. As Franklin noted, "these Libraries have improved the general Conversation of Americans, made the common Tradesman and Farmers as intelligent as most Gentlemen from other Countries, and perhaps have contributed in some Degree to the Stand so generally made throughout the Colonies in Defence of their Privileges." 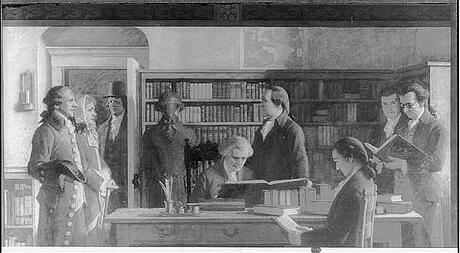 This image from the Library of Congress documents Franklin opening the first subscription library, in Philadelphia. This was an important precursor to the free libraries that exist today. When Jefferson's family home burned down in 1770, he most lamented the loss of his books. Yet he immediately began building a new collection. Even during the American Revolution and his time as ambassador to France, Jefferson managed to continue adding to his personal library. By 1814, he'd built the largest personal library in the United States. When the Library of Congress burned down in 1814, Jefferson offered to sell his library to the government. They purchased it for $23,950. The library again caught fire in 1851, destroying almost two-thirds of Jefferson's collection. The remaining items (almost 2,000 books) are still on display today at the Library of Congress. 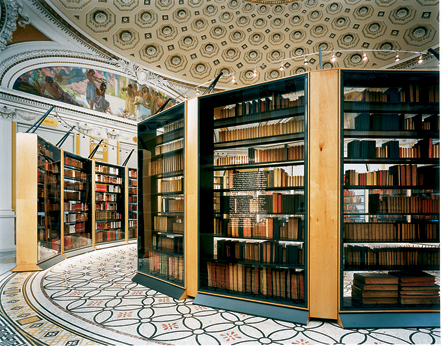 Thomas Jefferson's library is on breathtaking display at the Library of Congress. The exhibition is open year-round. 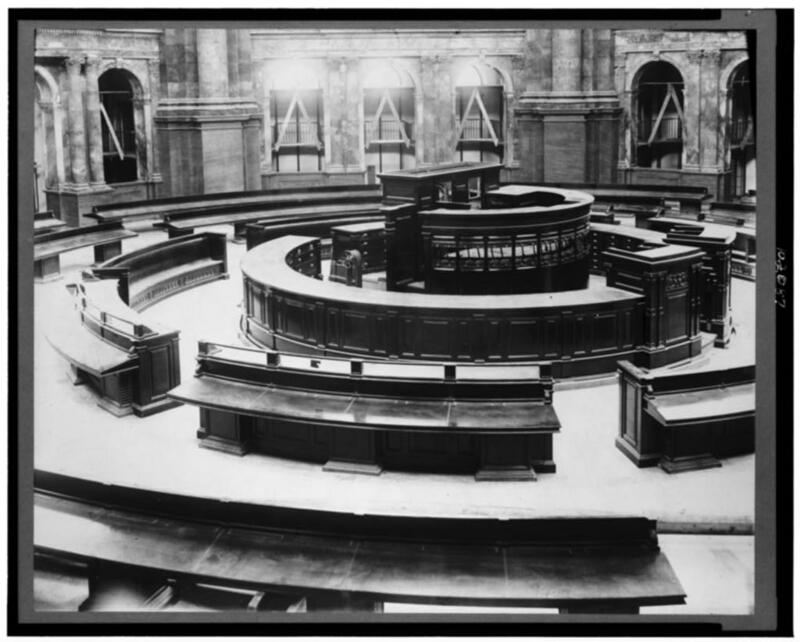 Pictured above is the main reading room in the Library of Congress Thomas Jefferson Building, under construction in 1880.
and left it here for fools to read. 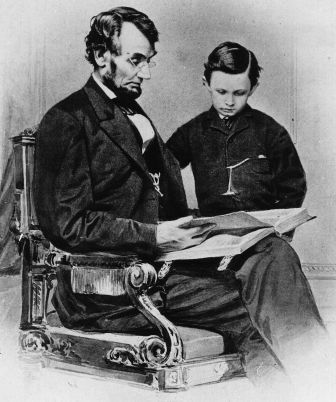 Abraham Lincoln peruses a book with his son, Tad. The Abraham Lincoln Presidential Library and Museum in Springfield, Illinois is located in the state capital building and is not associated with the National archives or national library system. While the resources circulate, if you visit this library and museum, you could see a original handwritten version of the Gettysburg Address or a signed copy of the Emancipation Proclamation. Though we know comparably little about the Barack Obama Presidential Center (which is expected to open around 2020), we do know that its home in Jackson Park on Chicago’s Southside will find it adjacent to Hyde Park, where the future president served as a law professor at the University of Chicago and where he and the first lady were married and still have a home. This proximity is expected to lead to academic collaboration between the University and the Center, which, in addition to the library, will be the new home of the Obama Foundation. The site itself will occupy much of the space that housed Chicago’s 1893 World's Columbian Exposition, near where Chicago’s Museum of Science and Industry currently resides. The Rutherford B. Hayes Center set the standard for preserving a president's papers, books, and artifacts. Franklin D. Roosevelt followed that lead, turning over materials in 1939 so that work could begin. 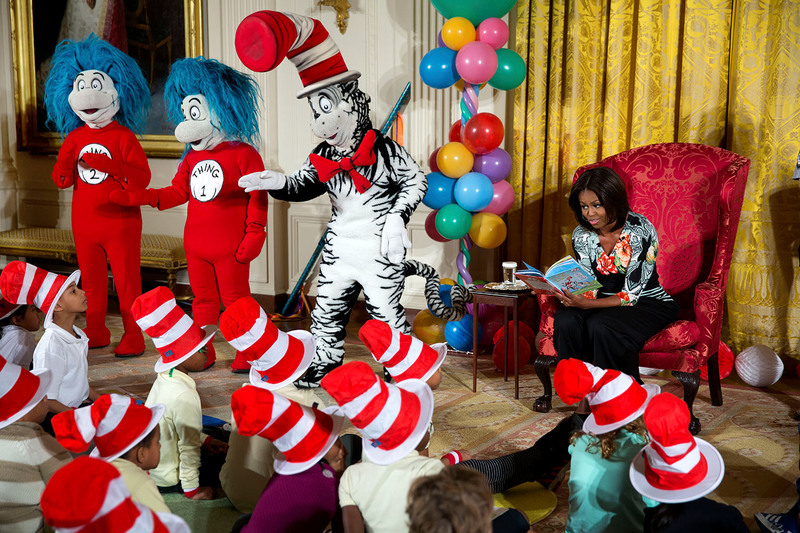 It was he who introduced the archiving system that presidents still use to this day. In 1955, Congress passed the Presidential Libraries Act, giving the National Archives authority to accept presidential papers, books, artifacts, and even land for libraries. Prior to that legislation, the vast majority of presidential libraries had been held by private collectors and institutions. Since then, and mostly spurred by Watergate, Congress has passed more legislation outlining the appropriate use of presidential records and documents.